We've struck gold with our latest free eCookbook 'cause it covers one of our favorite topics: cake mix recipes. The Mr. Food Test Kitchen's latest venture, Tempting Cake Mix Recipes: 30 Simple Recipes with Cake Mix, covers a wide variety of desserts, from cookies to cupcakes to cobblers to muffins and more. This pantry staple is a secret ingredient you'll start using anytime you need to whip up a tasty dessert recipe in a snap! With so many different kinds of dessert recipes out there, it can be tricky to decide where to start. You want your first foray into the dessert arena to be filled with happy memories. Luckily, the Mr. Food Test Kitchen is here to help. Not only are all of the dessert recipes on our site made with our signature "Quick & Easy" cooking style, but our collection of recipes with cake mix takes it another step further by showing you how to turn this pantry item into your culinary secret weapon. We've got a diverse mix of recipes with cake mix that'll fit your every need from fancied-up cake mix cake recipes to extra soft cake mix cookie recipes to unbelivable muffin recipes and much, much more. Homemade desserts don't need to be intimidating when you've got this handy guide walking you through every step. The best part? Using a boxed cake mix cuts back our prep time, so we're in and out of the kitchen in no time. Want to know more? Keep reading to find out what tasty recipes with cake mix we've got in store. Plus, for frosting ideas, check out our collection of Homemade Frosting Recipes: 14 Frosting Recipes for Cakes, Cupcakes, and More. Download your free copy of Tempting Cake Mix Recipes: 30 Simple Recipes with Cake Mix today. Whether you're heading off to a book club meeting or you want to send over a nice gesture to the new neighbors, there are plenty of occasions that call for a good cake mix cookie recipe. And boy, do we have the best variety! 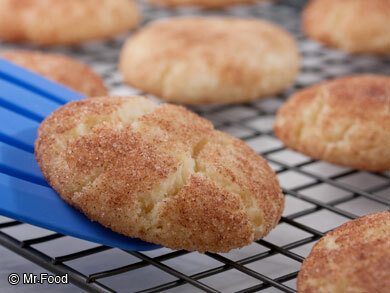 If you want a sweet cinnamon-sugar confection, our Cake Mix Snickerdoodles (page 1) really top 'em all. They're especially yummy fresh from the oven! If you're a carrot cake fan, then we know you're going to love our cake mix recipe for Carrot Cake Cookies (page 2). Top 'em off with some buttercream frosting for an authentic experience. And if you're looking for a way to brighten up the mood in the entire room, then we recommend you try one of our favorite recipes with cake mix: Lemon Coconut Clouds (page 6). The burst of lemon flavor really adds a bit of sunshine to anyone's day. We recommend stocking up on different flavors of boxed cake mixes and try out all different kinds of cake mix cookies. Is there anyone out there who doesn't love a good ol' chocolate cake mix recipe? We didn't think so! When those chocolate cravings kick in, it's good to know that you've got a few reliable Mr. Food Test Kitchen recipes that'll keep your sweet tooth satisfied. You could start out with one of our favorite summertime recipes with cake mix we like to call Chocolate Cola Cake (page 8). 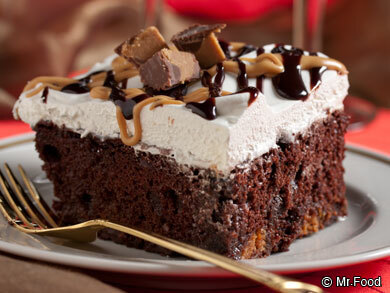 With a splash of soda, we know how to make this chocolate cake recipe anything but boring! If you're looking for a real dose of decadence, then you'll want to check out our recipes for Chocolate Fantasy (page 10) and Million Dollar Cupcakes (page 11). Dripping in hot fudge, both recipes are dreams come true for chocolate aficionados. Whether you need a rich sweet for a birthday party or just want to reward yourself during the week, these cake mix recipes know how to deliver... without you needing to spend hours upon hours in the kitchen! If you're having a glum kind of day, there's nothing like a few lemon cake mix recipes to really brighten things up. Lemon desserts are a great way to break up the litany of chocolate- and vanilla-flavored items, especially because it's so unexpected! If you're looking for ways to stand out from the crowd at your next potluck, we think the gang will go wild for a slice of our Lemon Meringue Cake (page 13). Top this cake mix dessert off with some whipped cream and watch as your friends and family start raving at how good it tastes. 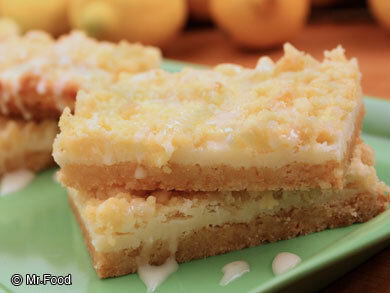 If you're looking for a bite-sized dessert that's easy to share or take on-the-go, then our Citrus Bars (page 14) might be the way to go. This tart bar cookie recipe is a refreshing change of pace from your average recipe with cake mix! And while we can't offer you a tropical vacation, we can offer the next best thing with our cake mix recipe for Key Lime Cake (page 15). It's a getaway for your taste buds! Want to know the difference between yellow cake mix and white cake mix? Yellow cake mix recipes use both butter and egg yolks while white cake mix uses just the egg whites, giving each a slightly different flavor. 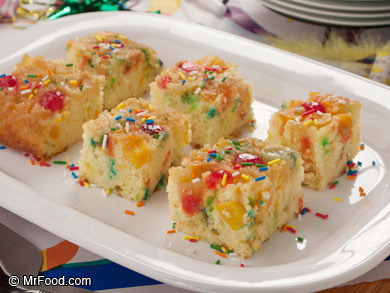 If you're a fan of yellow cake mix recipes, then we're got some fantastic recipes up our sleeves. If you're looking for a colorful cake to celebrate a big event, we know our Confetti Upside Down Cake (page 18) is a perfect fit. It bakes up in only 30 minutes and makes a cheerful addition to any spread. If you're looking for a bring-along to your next weekend soiree, one of our favorite recipes with cake mix has to be our Peanut Butter Bars (page 20). Paired up with a glass of milk, it's like bringing Grandma's cooking to your very own kitchen. Speaking of Grandma, if you're looking to bring up talk about the good ol' days, there's nothing like sharing a plate of Hummingbird Muffins (page 24) to get those happy memories flowing. Don't worry; the fun doesn't stop there! We've still got a whole other chapter filled with white cake mix recipes to cover. We don't know about you, but we absolutely love apple desserts. We look forward to them every fall which is why we can't wait to show you one of our best recipes with cake mix: Fresh Apple Crumb Bake (page 26). All you need is a scoop of vanilla ice cream, and you've got a truly memorable dessert! We've even included a recipe we originally featured during our Disney week: Magical Stuffed Cupcakes (page 28). We've got a surprise in the middle that makes this cake mix recipe extra special. And if you've ever had a late-night craving for something sweet, we know just the recipe that'll make you smile. 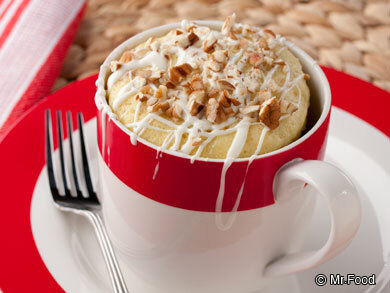 Grab your favorite mug and get ready to make one of our Italian Cream "Mug" Cakes (page 29). You'll be grateful for this one the next time you run into a rainy day and need a lil' pick-me-up! As a fan of the Mr. Food Test Kitchen's Quick & Easy cooking philosophy, I know you can see the value in this free eBook. Try out these delightful cake mix recipes with the free Tempting Cake Mix Recipes: 30 Simple Recipes with Cake Mix. Once you subscribe to receive our newsletter, you'll see how much fun it is to be a part of the Mr. Food Test Kitchen community! If you've ever searched for quick and easy recipes, fast dinner ideas, slow cooker recipes or anything in-between, let MrFood.com deliver triple-tested recipes straight from our Mr. Food Test Kitchen that are both easy to make and delicious to eat. Check out this free eBook and the MrFood.com site to draw tons of inspiration for your next holiday or meal! Love your e-books. There are so many wonderful recipes in them. I enjoy trying new recipes from them as they are always so good. I have to thank you for the wonderful E-books. I have found some really good recipes. Please keep up the good work. Hope and pray that you and yours had a very Merry Christmas and may you New Year be better than ever before. Thanks for the E-cookbooks. They are a real gem. I haven't tried all the recipes, but I have time. You say free ecookbook, download, but I can't get any of the recipes. It won't download. i can not wait to try these. i love these books!! thank you so much. My grandkids loved helping me make these delious recipes. They all look so good. Thanks again. I love using cake mixes, so will enjoy the recipes. Loved Mr Food and he is missed, but I think that it is great to still have the cooking on and you do a good job. cant wait to get the recipes. I want to unsubscribe to Mr. Food but can't get the site up - just says it's logging in. Since the real Mr. Food passed away I don't think the site is as good as it used to be. This ecookbook is another winner! Collect them all! They are fantastic! I am very proud and interested to join Mr. Food Test Kitchen to learn many kinds of recipes. This is very amazing to me.